Kim Taipale, “Law Enforcement and National Security in the Information Age: Technology, Security, and Privacy in the War on Terror“, Dirksen Senate Office Building, Capital Hill, Wash., DC (Oct. 14, 2004). Paul Trevithick, William Coleman, John Clippinger, and Kim Taipale, “Identity and Resilience” (2009). Available at the White House Cyber Policy Review web site. 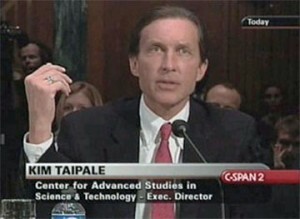 K. A. Taipale, “Technology, Security and Privacy: Confidential Memorandum for the Department of Defense Technology and Privacy Advisory Committee (TAPAC)” (Dec. 5, 2003). Available in the National Archives. K. A. Taipale, “Deconstructing Information Warfare“ presentation to the Committee on Policy Consequences and Legal/Ethical Implications of Offensive Information Warfare, The National Academies, Washington, DC, Oct. 30, 2006. K. A. Taipale, “From Data Mining to Computational Social Science for Counterterrorism“ presentation to the Committee on the Technical and Privacy Dimensions of Information for Terrorism Prevention and Other National Goals, The National Academies, Washington, DC, Apr. 27, 2006. K. A. Taipale, “Technology, Policy, and Cultural Dimensions of Biometric Systems,” presentation to the Computer Science and Telecommunications Board, The National Academies, Washington, DC, Mar. 15-16, 2005. Munich Security Conference 2018, Munich (Feb. 16-18, 2018). Kim Taipale discussed "Blockchain and Government," PLENS, New York (Jun. 9, 2017). Global Cyberspace Cooperation Summit VII, EastWest Institute, UC Berkeley, CA (Mar. 14-16, 2017). Kim Taipale presented "A Framework for Cyber-Deterrence" at the Boston Global Forum Cybersecurity Day Conference, Harvard University (Dec. 12, 2016). Kim Taipale participated in the MSC Cyber Security Summit Silicon Valley 2016 (Stanford University, Sep 19-20, 2016). Kim Taipale discussed "AI and the Future of Work" on TechTrends NPR (Oct. 18. 2017). "Building Trust with Blockchain," IBM Blockchain for Government Blog (Sep. 2017).